A holly has glossy evergreen leaves, right! No, not always. Ilex verticillata, Winterberry Holly, or Winterberry is our native, wetland holly that loses it leaves each autumn. This beautiful shrub is all the showier because its lack of winter leaves makes its berry display all the brighter. After the leaves have turned yellow and have fallen off, you are left with a breathtaking view of thousands of brightly colored berries clinging to every stem. What a joy to have such color in the middle of winter. Ilex verticillata is an amazing plant with a tremendous geographical range and a very diverse genetic expression. Range: The native population of Ilex verticillata stretches from Nova Scotia, south to Florida and west to Missouri. It can be found throughout Michigan in low grounds, moist woods, swamps and occasionally in higher, drier soils. Soil Preference: Even though it is most commonly found in low swampy soils, winterberry can also be grown quite successfully in your average garden soils. Problems: Winterberry is an easy-to-grow plant that has few serious insect or disease problems. Size: As for its genetic variation, winterberry can range in heights from 3 feet to 15 feet. The width of the plant is also variable. Growth Habit: In wet sites, winterberry normally suckers to form a dense spreading thicket. In drier garden soils, it tends to form a tighter clump. At blooming time this plant has little to attract attention. It has very small, inconspicuous white flowers, with male flowers and female flowers found in different individual plants. It is autumn, however, when this plant comes into its own when its slender branches are draped with small but numerous berries right to the branch tip. 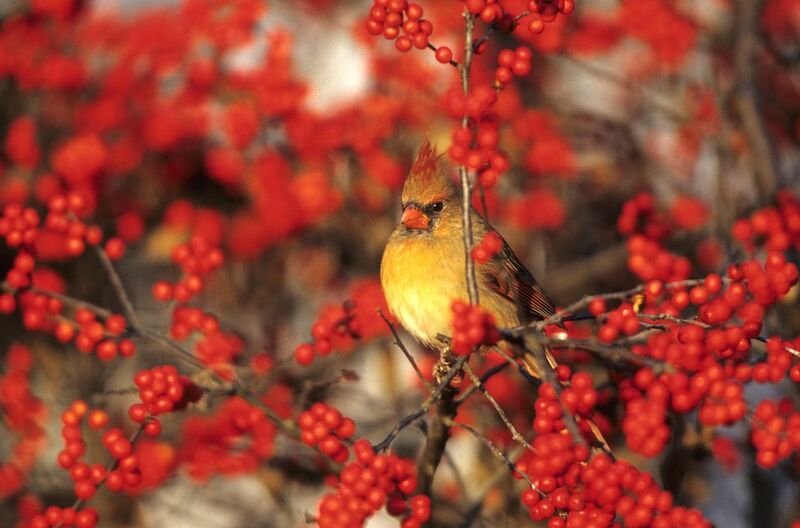 The berries remain on the plant until midwinter adding color to the landscape when it is most needed. To facilitate a good berry set it is advisable to purchase at least one male for every three to five female plants and to plant the male in close proximity. There are so many wonderful winterberry Hollies, you are sure to find one that would dazzle in your yard. Take a look at the variety available in winterberries. There are a good number of named cultivars to choose from in the market. The red-fruited cultivar 'Oosterwijk' is a Dutch selection that is very popular in Europe for the production of cut branches. It is noted for holding its color and berries as a cut branch in flower arrangements. The most popular American selection for cutting is 'Winter Red'. The bright red berries are of medium size and produced in abundance. It is a multi-stemmed; erect plant maturing at 8 to 9 feet in height. One of my favorites is called 'Cacapon'. This beautiful plant has attractive, dark glossy green leaves and compact branching. It has abundant bright red fruit and makes a great landscape plant with year-round interest. It matures to 6 to 8 feet and has a nice rounded habit. If you are looking for a smaller plant, 'Red Sprite' is a fantastic low mounded selection that matures at 3 to 5 feet. It has attractive, clean, dark green foliage, and tight branching right down to the ground. This plant makes a great low hedge or mass planting. its low stature makes it an indispensable variety. For those looking for something a bit different, try 'Winter Gold'. This is a yellow-berried sport of 'Winter Red'. The berries are not really gold, but instead an attractive pinkish-orange that lighten up with age. Another attractive color variation is 'Aurantiaca'. This beauty has bright pinkish-orange fruit that lightens with time. It is an eye-catching plant, although a bit untraditional. Having a rich abundance of Winterberry Holly in Michigan, it is impossible not to hone in on a few exceptional native specimens. After years of observation, we have chosen two plants worthy of introduction. We had also been observing a native plant located in a ditch right alongside the road. For years we would drive by this plant, and every autumn it would produce a very heavy crop of bright orange-red fruit. After years of admiration, we finally introduced this beauty under the name Berry Heavy®. Are these two plants the absolute, very best selections available? Only time will tell how good they are, but they just seemed too good not to share. As with all new plants, growers and landscapers will determine how good a selection is and the cream will rise to the top. A mass planting. Winterberry is a tough, easy to grow shrub that looks great in mass. Use it in place of Viburnum dentatum, arrowwood viburnum. Winterberry is the perfect plant for wet or poorly drained sites. Use it around retention ponds or near a runoff ditch. Don't restrict this worthy plant just to wet sites, it grows just fine in drier soils too. With the new demand for native plants, winterberry fits the bill and looks good too! As the old commercial use to says "Try it - You'll like it!" Is It a Holly or a Boxwood?